The animations in Ruby of the Nile are restrained in keeping with the theme. There are mainly different light effects that make the symbols more pronounced when they appear in paying combinations. The background music is also appropriate. 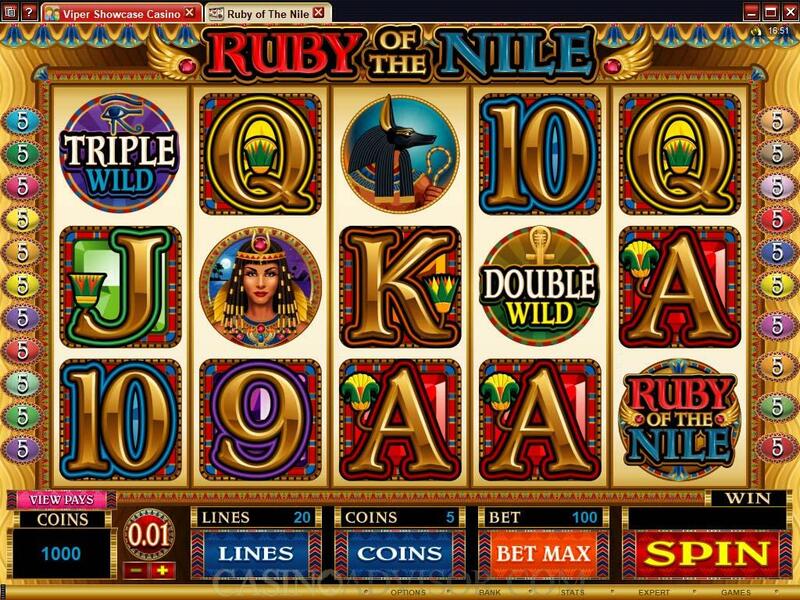 Players can adjust all three betting options in Ruby of the Nile slot game. The coin size range is reasonably large. The permitted coin sizes are 0.01, 0.02, 0.05, 0.10, 0.20, 0.25 and 0.50. Unfortunately this advantage is somewhat negated by the maximum number of coins, per line, which is five. There are 20 paylines, which is neither very high nor very low. Together these betting options combine to give a maximum total bet of 100 coins or 50.00 credits. The Microgaming Expert mode is available for convenience in setting the betting parameters. Though Ruby of the Nile has a common theme it has a very unusual structure. Only the six high value card symbols offer line payouts. And if this low number is a turn off then the payouts offered are a bigger turn off. The largest payout for getting five Ace symbols in an active payline is only 75 coins, which really does not amount to anything. But this is compensated in various ways. There are two wild symbols in the slot game. The Double Wild doubles payouts and the Triple Wild triples payouts. The low number of line payouts are made up for by a higher than usual number of scatter payouts. There are four symbols that offer scatter payouts. These are Ruby of the Nile Logo, Queen, Bennu and Anubis. Unlike the line payouts, the scatter payouts are not low. 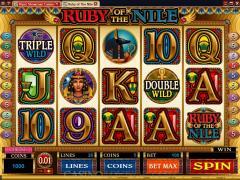 The largest is 100 times the total bet for getting five Ruby of the Nile Logo symbols anywhere on the reels. 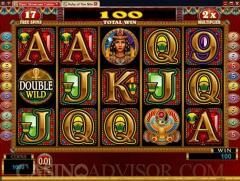 Another attraction is that the two wild symbols substitute for the scatter symbols and multiply scatter payouts as well. If the Treasure Chest symbol appears in the middle row on reel five then the free spins bonus round is triggered. The players are awarded up to 20 free spins, the number being chosen randomly. During the free spins all payouts are doubled. The free spins can be retriggered. 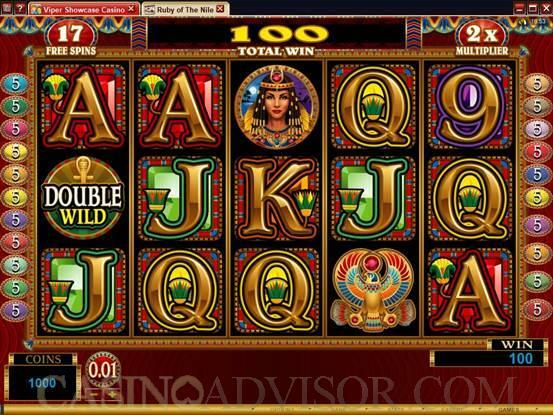 Ruby on the Nile does not offer a bonus game on the second screen or a gamble game. Also there is no progressive jackpot. Interested in reading more detailed information about Ruby of the Nile? If so Click Here for more details.